How’s your 2018 eCommerce journey? Is it exactly what you had hoped for? Whether you’re ready or not, this year’s eCommerce chapter is about to end and 2019 is fast approaching. While you’re still busy planning for the holiday rush, it’s also the time to get your business ready for the upcoming new year. Focusing on the ever-changing eCommerce market, we have carefully curated 2019’s essential eCommerce dates to get you all prepared. 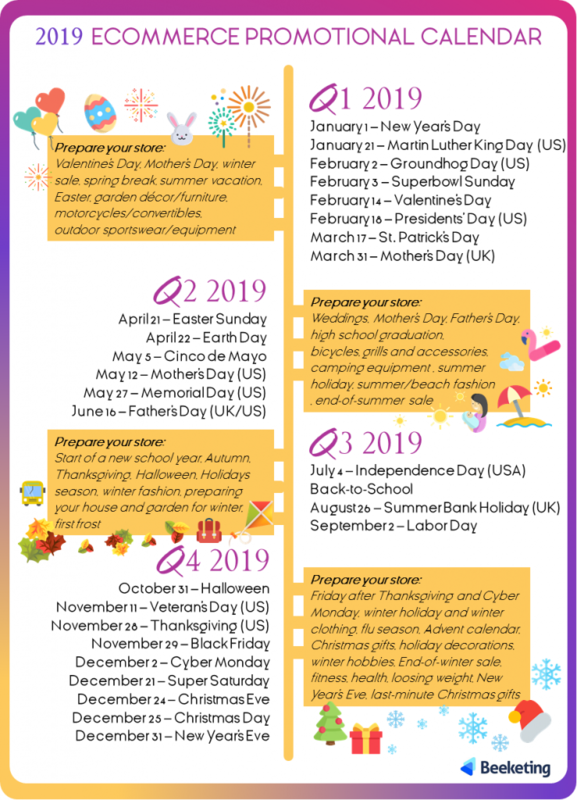 Our comprehensive 2019 eCommerce promotional calendar will give you a head start in preparing for the most notable events, holidays, and observances. The key calendar dates that generate the most eCommerce revenue. The most popular and niche events to run timely and relevant marketing campaigns and promotions. Some exclusive marketing tips and promotional examples to get you to spark some ideas and ready for execution. To help you crush your sales goals this new year, below is an infographic of the key dates to build around your promotional plans for 2019. We encourage you to save or print this 2019 eCommerce Promotional Calendar. Even though 2018’s just closing its chapters, your job as an online store owner never stops and that’s most especially true when the first day of January begins to kick in. After the sudden spike in holiday sales, January 1 marks the day where sales start to plummet fast. January is a mix of post-holiday nostalgia and back to reality awareness. People are still lazy to go back to their daily routines and still clinging on the holiday spirit so this is the best time to keep the momentum of your holiday sales by running extended post-holiday promotions. Alternatively, this is a chance for you to make things exciting for them and reignite their spirit by offering something fresh. Psychologically speaking, all shoppers have this “new” mindset: new year, new you, new resolution — why not launch new products or offer something different? 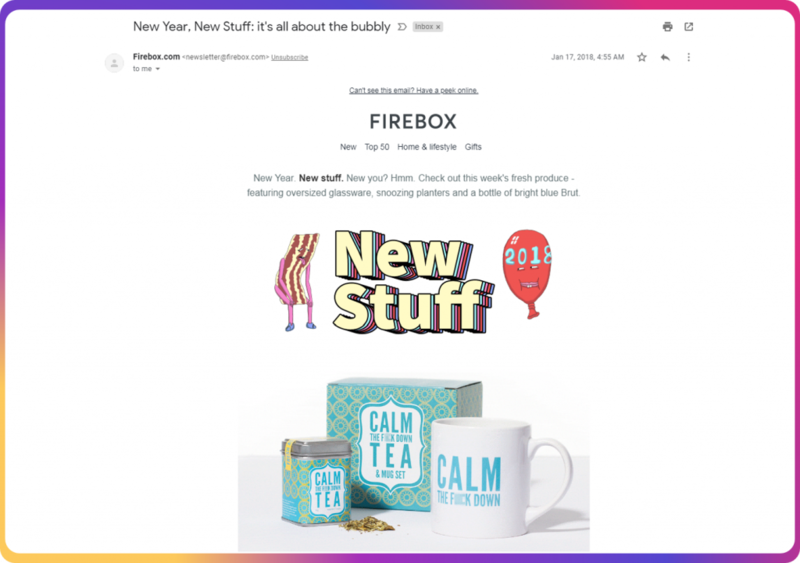 For example, Firebox sent the “New Year. New Stuff” email campaign to get its customers excited about the new year. 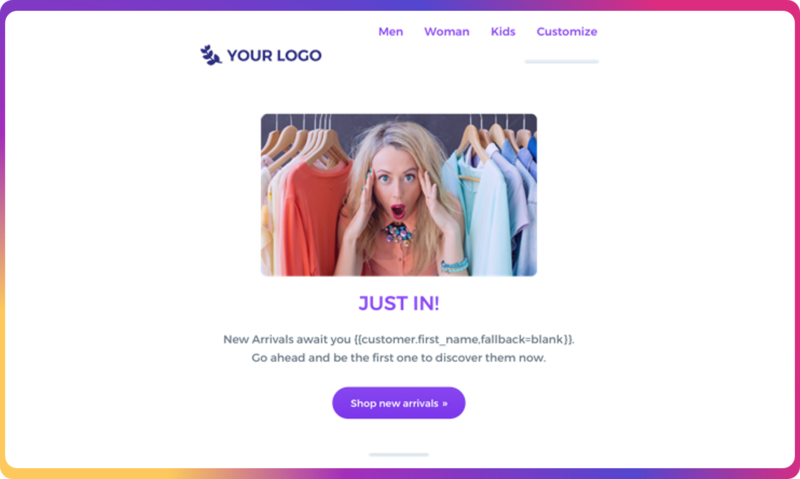 You can steal this email campaign with Mailbot’s ‘New Arrivals’ feature. What it does is it can detect new products on your store and will automatically create a ‘New Arrivals’ email campaign to promote your new products to your customers. Your first significant 2019 eCommerce promotional calendar date will be February 14 – Valentine’s Day. In the U.S. alone, 2018 generated the highest sales (20.1 billion U.S. dollars) from Valentine’s Day gift purchases over the past 10 years. 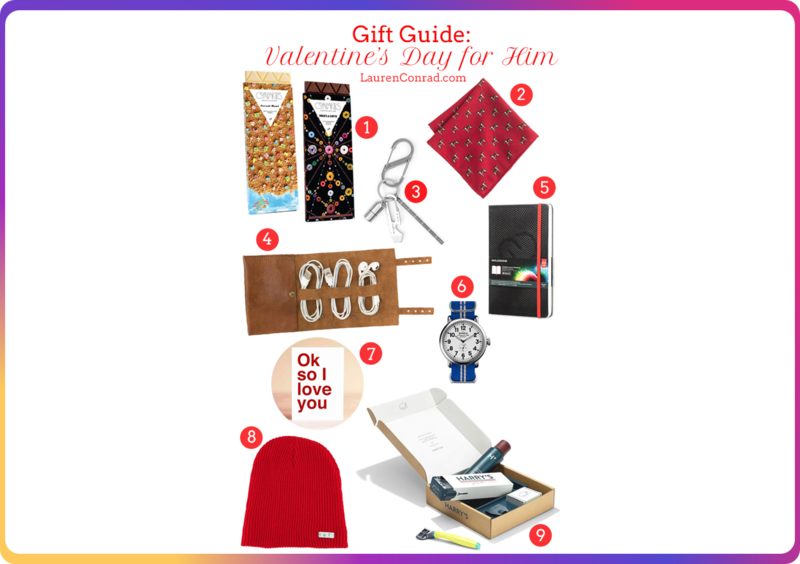 Be prepared with your Valentine promotions by targeting couples with gender-specific gift guides. Create headlines such as, “Valentine gifts for your boyfriend” or “Gifts for your favorite valentine”. You can also collaborate with gift guide curators or bloggers to include your products in their Valentine’s Day gift guides. Gift guide curators, such as Lauren Conrad, are perfect partners to promote your products during Valentine’s Day. Mother’s Day has etched its way as a major eCommerce date and became 3rd biggest retail holiday next to Black Friday and Cyber Monday season, and Valentine’s Day. Its commanding attention has totaled a revenue of $23.1 billion US dollars this 2018 in the U.S. alone. With this enormous market, every eCommerce store owners will be joining the celebration. This means competition will be tough and so you need to plan ahead to stand out and appeal to your target market. Mother’s day is celebrated in various dates across the world, but the majority of the countries celebrate it on the 2nd Sunday of May so run your promotions in congruence with the locations that you cater to. ThinkGeek launched its ‘Supermom’ campaign to provide as a Mother’s Day gift center. Father’s Day generated a near-record $15.3 billion U.S. dollars this 2018. Like Mother’s Day, people feel pressured or obligated to purchase for their dads on Father’s Day. This stems on cultural norms and the nature of children’s relationships with their parents. We can attest that both Mother’s Day and Father’s Day are both gaining significant popularity on 2019 eCommerce promotional calendar. So, ensure that you have the right marketing strategies and sales promotions in place to capitalize on these days. Gone are the days when Halloween is just about wearing costumes or doing some pumpkin carving. For many eCommerce store owners, it is beyond the dress ups and trick-or-treats. Many of them mark the Halloween as the beginning of the festive holiday season. While Halloween observances are different from one country to another, the same phenomenon happens where people all over the world shop online to participate in the Halloween celebration. In the U.S. alone, Halloween has reached 9 billion U.S. dollars this 2018. Make your Halloween promotions as spooky, festive, and funny all at the same time with these Halloween marketing tips. By Thanksgiving Day, both online shoppers and online store owners are busier than ever. Last year, Thanksgiving Day has reached 18.3% YOY growth ($2.87 billion online revenue). From then on, the eCommerce world is in full-blown as it reaches the most profitable 2019 eCommerce promotional calendar period: Black Friday and Cyber Monday. Black Friday and Cyber Monday (BFCM) is where all eCommerce store owners put most of their time and effort. Last year, BFCM generated a combined 11.62 billion US dollars in online revenue. As online shoppers are about to spend extravagantly during the BFCM period, make sure your online store is fully optimized and prepared by using this ultimate guide to Black Friday & Cyber Monday. Also, don’t forget to adjust your online store to cater to the sudden influx of traffic. During BFCM period, the competition is at its fiercest. Your competitors offer enticing deals and discounts which means that all shoppers have the luxury to choose from a variety of products. Make sure that you intensify the sense of urgency by using quantity and time-related triggers. For example, you can add countdown timers to your deals as indicators that in order for shoppers to avail of the discounts, they have to act immediately because the clock is ticking. You can also add a stock countdown to your product page to tell shoppers if the product is about to be sold out. Lace N Loop used the Countdown Cart tool to display a countdown timer of their discounts and the remaining number of items left in stock to intensify their customers’ sense of urgency. Then after BFCM, the Christmas season is the last highlighting 2019 eCommerce promotional calendar period of the year. Christmas shoppers are expected to spend approximately an average of 794 U.S. dollars on Christmas gifts. Get ready to decorate your online storefront with festive designs to welcome the holiday spirit. If you want to win the holiday shoppers over, make sure to use this guide of holiday marketing ideas. Your Most Prosperous New Year Yet! Whenever a new year arrives, it gives you a moment to look back and gain insights from what you have accomplished from the previous year. It also gives you another chance to learn from the things you’ve missed out. A new year means a new opportunity to unlock your full sales potential. Our in-depth 2019 eCommerce promotional calendar will help you plan all your marketing promotions this upcoming new year, ensure that you’ve got the most profitable dates and events covered, and achieve your most prosperous new year yet.